Distribution: A widespread species occurring in Queensland, New South Wales, Victoria, Tasmania and South Australia. It occurs in a variety of habitats from coast to mountains, usually in open forest/woodland and sometimes in heath. 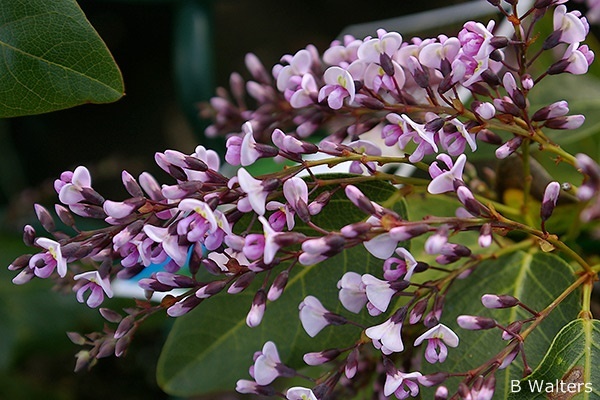 Derivation of Name: Hardenbergia...after Franziska Countess von Hardenberg. violacea...referring to the typical flower colour. 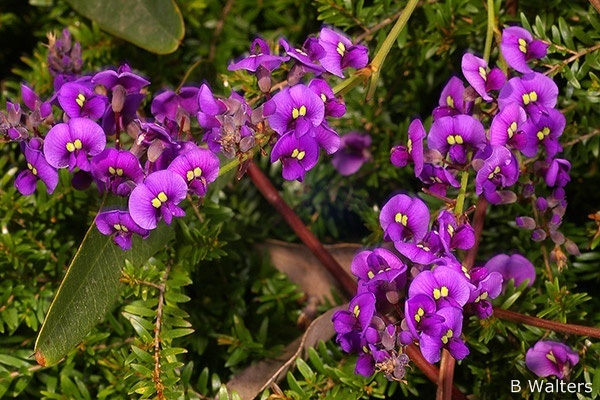 Hardenbergia is a small genus of three species, the most common and best known of which is Hardenbergia violacea. Hardenbergia violacea is usually a climbing plant whose branches twist around the stems of other plants. It is moderately vigorous but rarely covers other plants so extensively as to cause damage. Shrubby forms without any climbing tendency are known. The leaves are dark, glossy green with prominent veins and are 75-100 mm in length. The flowers, which appear in winter and spring, are usually violet in colour but pink, white and other colours are sometimes found. The flowers are the typical "pea" shape consisting of 4 petals; the "standard", the "keel" and two "wings" as shown in the diagram below. "Bushy Blue" (shrubby - blue-purple flowers). H.violacea is a popular and generally hardy garden plant which is widely grown. It is adaptable to most soils and aspects although sunnier positions will usually result in better flowering. Given the wide range of the species, however, forms from drier areas may not be vigorous in tropical areas, and vice versa. Where possible, it is best to select forms from similar climatic zones to the area where they are to be cultivated. Propagation is easy from seed following pre-treatment to break the physical dormancy provided by the impervious seed coat. Pre-treatment can be carried out by abrasion or by the use of boiling water (further details can be found in the Seed Propagation page). The seed retains viability for many years. Cuttings strike well using firm, current season's growth. Thanks to Cas Liber for information on cultivars of this species.